We’d love your help. Let us know what’s wrong with this preview of It's Not Complicated by Richard Ronald Nason. It's Not Complicated offers a paradigm shift for business professionals looking for simplifie In the new knowledge economy, traditional modes of thinking are no longer effective. Compartmentalizing problems and solutions and assuming everything can be solved with the right formula can no longer keep pace with the radical changes occurring daily in the modern business world. To ask other readers questions about It's Not Complicated, please sign up. 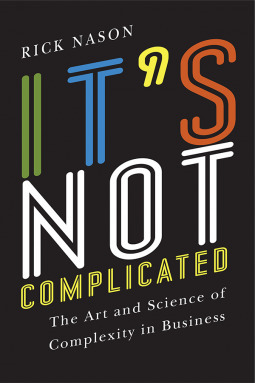 Very interesting and extremely readable introduction to the use of complexity in the business world. There will be huge benefits to reap for managers and business that embrace complexity thinking before their competitors, and Nason does a terrific job of enforcing this point in an approachable way.